Fiprotec Spray for Cats and Dogs is an effective veterinary strength medicine to control fleas, ticks and biting lice on cats and dogs from 2 days old. 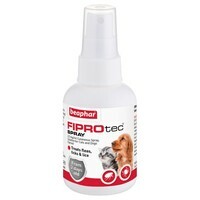 Containing the well-known active ingredient Fipronil, Beaphar FIPROtec Spray kills ticks for up to 1 month on cats and dogs, and kills fleas for up to 2 months on cats and 3 months on dogs. Not recommended for cats and dogs weighing more than 10kg due to the quantity of sprays required to treat.